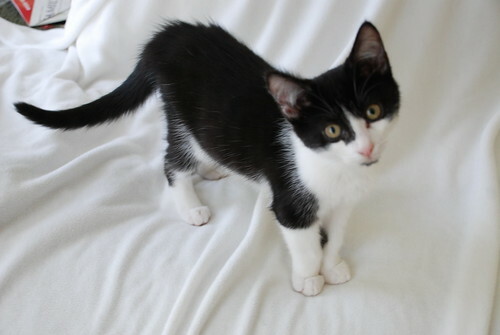 Spree was adopted on Friday night by a very nice, young couple. The couple was looking for a pair of kittens. They held Dash and Stache first and those two boys put on the charm. They were totally chilled out and relaxed and were loving the man and woman up. I thought for sure they would be adopted. I felt sad for Spree as she sat in the crate by herself. She looked lonely. I mentioned they could also adopt Spree. In reality, three cats really aren't that much more expensive than two. You at least want two litter boxes and all the expensive stuff has already been taken care of by Lost Dog Lost Cat (spay, neuter, distemper shots) all they need is rabies and every year its the rabies shot and annual physical. They asked how much that typically costs. It depends on the vet, it really does. The vet I take my three (Ranger, Scout and Stryker) is pricey, but I like them. 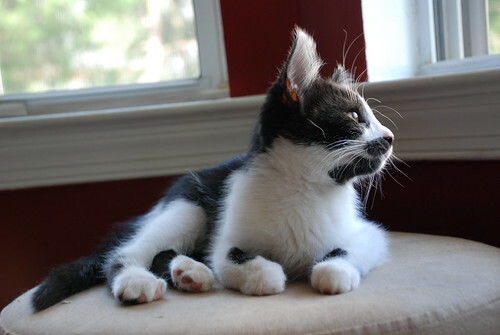 It typically costs about $100 a cat every year. I told them that. The man flinched. Guess it was good I didn't mention Stryker's broken leg that set me back 5 grand. They took Spree back into the quite room to get to know her for a little bit. Then the couple came out of the "quite" room and saw the really little kittens. The woman fell in love with one active, female, gray tabby named Zola. They asked if they could adopt one of the boys along with Zola. I told them I really wanted the boys to go together. Spree would probably be the best fit with Zola. One of the boys would overwhelm a smaller kitten. They are just very aggressive with their play. Very affectionate but they are all boys. So they chose Zola and Spree. The gal came back on Saturday so Spree could get her last distemper shot. I got to see her one last time. She had a cute, preppy, black, pink and white plaid collar on. The gal was getting name tags made for their collars. I didn't ask what Spree's new name was. Spree and Zola are going to be spoiled rotten. I went with the gal through Pet Smart and was showing her all the things Spree really liked (feather toy, bungee toy, kitty lounger, food). They left with a full cart. It was cute, almost like watching new parents take their first baby home. On Saturday she said that Spree had climbed up on her shoulder that morning and was giving her kisses. Was very affectionate. Yay! So often she'd come up to me for cuddles and then Dash and Stache would run over and muscle in. She's going to be the 'big sister' now with Zola. Now, to find good homes for Dash and Stache. They really need to go together. They have been side-by-side since the day I got them. Remember this cute picture of them from the first weekend they were at my house. Here they are getting into trouble together. 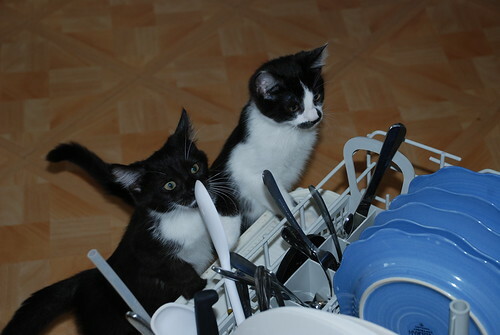 Well, I guess they aren't really getting into trouble, they are trying to "help" me unload the dishwasher. Its amazing what becomes a big adventure to a kitten. You are wondering how Dash escaped death. Well, this cute little head of his ended up inside the mouth of a big dog. How did it get there? you ask. Let's just say, exclaim actually, "Praise God for His mercies regarding my stupidity and for His protection!" There was this dog, some kind of hound mix, really looks like a good bird dog. When the walker would walk him past the cats, the dog sat down and literally had to be dragged away from the cats. He didn't seem aggressive toward the cats, just curious. I try to expose the kittens to the dogs. Dash and Stache have been really good. Usually the dogs just sniff them, maybe a lick and then that's it. So I showed the dog Dash. The dog sniffed and then "Bam!" snapped at Dash's head. The walker yanked back on the dogs leash, Dash went on the attack and was quite ferocious. I jumped back. Drama at the entrance of Pet Smart. Dash had pulled back into the crook of my arm with his head as far back as possible with his paws up on either side. His eyes were big, round, the whites showing with fear. They were unblinking, almost as if he were in shock. If he could talk, he probably would have shouted, "What the hell! I just saw the four short months of my life flash before my eyes!" I checked him out, no broken skin from the bite. I suppose Dash has good reflexes with shrinking back from Ranger's snaps. He was a tense ball the rest of the day. That dog, when it was walked by, just stared at Dash in the crate, and Dash stared at it. I felt awful. What an idiot I am. I will never let Dash or Stache near another dog again. 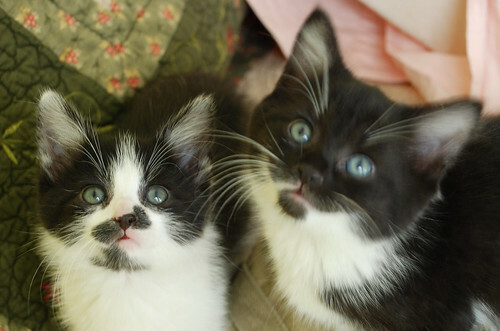 So, hoping that next week, someone adopts the boys. I'm getting worried, as they now look like small cats. They have lost the kitten cuteness, but are still adorable. Oh, I wish I could have those kitties! So sweet. And so kind of you to care for them while they wait for a permanent home. Do you plan to foster more pets in the future?